I know it’s been forever FOREVER since the last time I posted a recipe, but it’s all going to change today! 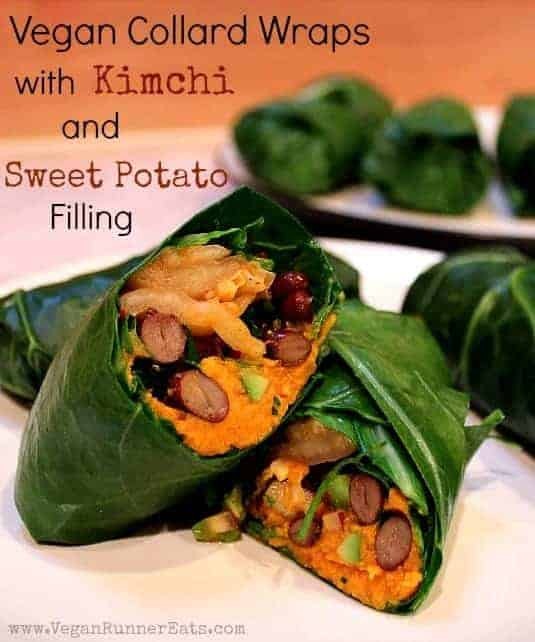 I’m particularly proud of today’s recipe for vegan collard wraps with kimchi and sweet potatoes because they seem to me like the healthiest food out there, with all of the veggies, fiber and probiotics – a perfect meal for springtime! Here’s the deal in our household: Rob eats almost all plant-based foods I put in front of him (a huge improvement from when we first met! ), but there are a few things he won’t touch. Collard greens are one of those things. He’s not thrilled with kimchi either. I, on the other hand, like both quite a bit, even thinking of fermenting some kimchi at home in the near future. So a couple weeks ago, when Rob was out of town on business, I knew it was my chance to experiment with both of those foods. I’ve made collard wraps before – the time when Rob put his foot down and said he would never eat collards again – but the process of rolling the wraps turned into a mess, with tough leaves not wanting to fold neatly no matter what I did. This time around, however, I got smarter and did some research on YouTube. This video turned out very helpful, and all of my wrap rolling troubles were resolved! I’ve also explained all the steps in the recipe below. 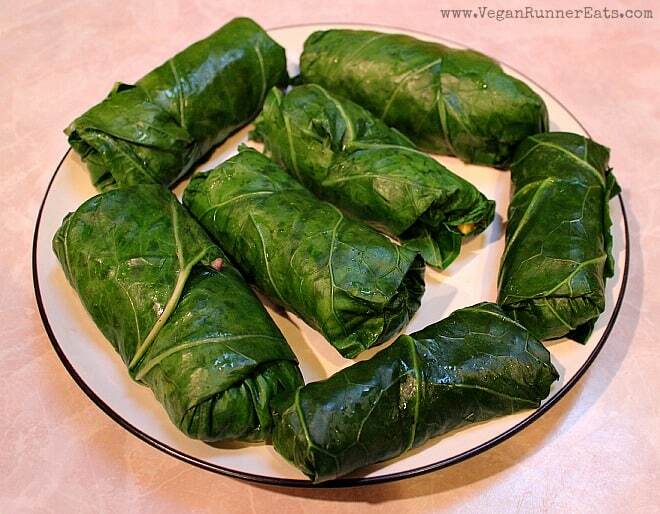 Like with most of my recipes, the filling of these vegan collard wraps can be customized to your liking. Don’t have black beans on hand? Use just about any other type of cooked beans, or even lentils if you so desire. No kimchi available? Use some sauerkraut (preferably unpasteurized, with good bacteria intact), or just squeeze some lemon or lime juice onto the filling just before you roll up the wrap. Don’t have a baked sweet potato? Microwave a raw one for 3-4 minutes and mash up the insides, or cube it and steam/boil it for 10 min, or use some cooked squash. As for kimchi, I’ve seen at least a few brands in stores here in the Pacific Northwest, but most brands either have non-vegan ingredients like fish sauce or tiny shrimp, or their ingredients lists feature some unpronounceable stuff that in my humble opinion has no place to be in healthy foods. Thankfully, a local company called Britt’s Pickles makes amazing vegan kimchi (they even have two types – a ginger-infused and a black garlic-based varieties), sauerkraut and pickles. If you live in Seattle area, I highly recommend their products (and no, they aren’t paying me to say that). I used the ginger-infused Market Kimchi for these wraps. 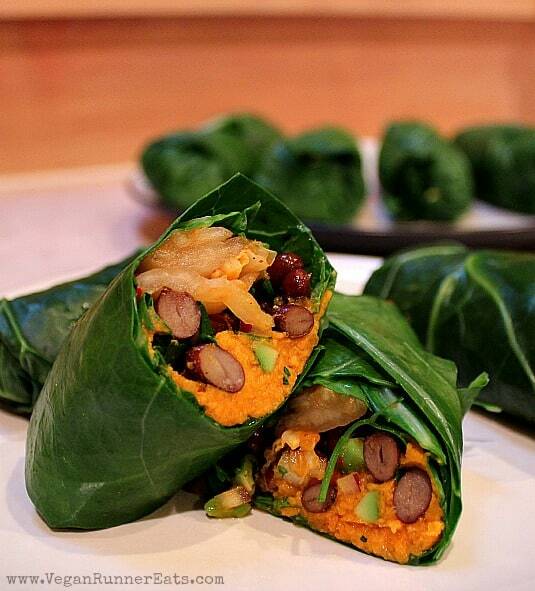 Healthy, delicious and light, these vegan collard wraps with kimchi and sweet potato filling make a perfect lunch or dinner. If you find a particularly large bunch of collards, just double or triple the filling, and make as many wraps as you’d like. They will keep in your fridge for a couple days. You can watch this video for detailed descriptions, or follow the steps below. Set a steamer basket over a pot of water, cover with a lid, and bring the water to a boil. Meanwhile, place a collard leaf on a cutting board, cut out the thick stem leaving about 2-3 inches on top to prevent separating the leaf in half. Repeat with the remaining collard leaves. Working with one leaf at a time, place each leaf into the steamer basket with boiling water, close the lid, and let the leaf steam for no more than 10-15 seconds. Take the leaf out using tongs, place on a plate, and repeat with the rest of the leaves. Peel the cooled baked sweet potato and slightly mash in with a fork. It doesn’t have to be mashed completely smooth. Set aside. To make the black bean salad, combine all of the ingredients in a bowl, from black beans to ground ginger. Stir lightly to mix, set aside. (You can refer to this video again, or follow the steps.) Place one steamed leaf on the cutting board. Cut the top part that was holding the leaf from separating in two halves. Slightly overlap one half of the leaf over the other, with a seam running down the middle of the leaf. Now, if you’ve ever rolled a burrito, the rolling part shouldn’t confuse you too much. Place the bottom of the leaf (the part closest to you) over the filling, tuck in the sides, and roll up the resulting pocket to form a neat little wrap. Repeat with the remaining leaves. To serve, cut the wraps in half diagonally, or bite into them burrito-style. Enjoy! *No kimchi available? You can use sauerkraut if you can find a good kind, or just squeeze a bit of fresh lemon or lime juice onto the ingredients of each wrap before you roll it up. See more tips for substitutions in the post above the recipe. As you may remember from my previous post, it was my birthday last week. Thank you so much everyone for your congratulations and kind words both here on the blog and on Facebook! The whole week felt special because of all of the comments on my birthday post rolling in. 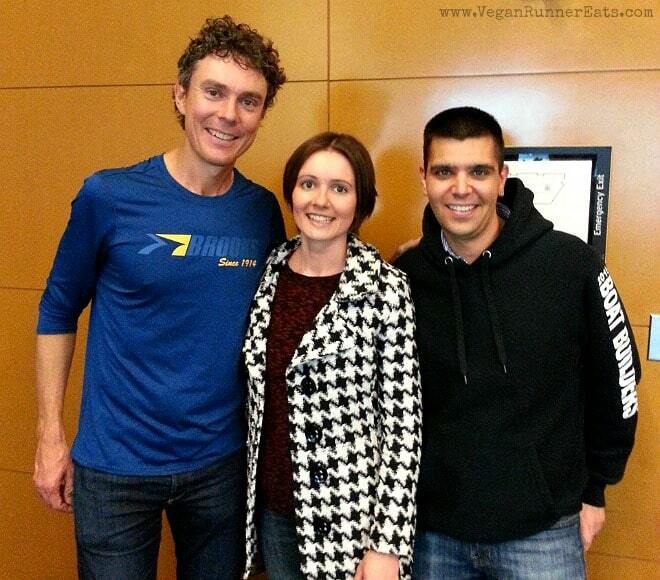 And then on Saturday another exciting thing happened – Rob and I met the legendary vegan ultramarathoner Scott Jurek in person at Seattle REI! Scott was in town to give a talk about his recent running adventures in the Himalayas and in the Snowdonia region in the UK. I randomly saw his post on Facebook announcing this event, and knew right away that I wanted to go. Back in the day, it was reading Scott’s book Eat and Run (as well as Christopher McDougall’s Born to Run before that, in which Scott Jurek was a prominent character) that gave me the determination to go vegan, first to improve my athletic performance and later to help animals. So in a way, meeting Scott in person felt a lot like meeting the real Mickey Mouse in person, or your favorite character from a book that influenced you in so many ways. Scott turned out to be very down-to-earth, talking about running trails and the safety etiquette (it helped that his longtime sponsor Brooks has lots of trail running-specific equipment – they’re not paying me to tell you that either 🙂 ). After the talk, he signed lots of books and took pictures with his fans. I was impressed that he took time to actually talk to each fan, so I thanked him for his book and the push it gave me to go vegan and get more interested in running. He even remembered his visit to the Southern Alabama a couple years ago for a book signing – it was in our town, but we were away for the weekend that time – and suggested that I should get into ultramarathons, or at least run some trails here in the Pacific Northwest. Question for you: Who (or what – a movie, a book) played a big role in helping you make a decision to go vegan/plant-based? If you’re not fully vegan yet but are thinking about making the switch, what sparked that thought in the first place? Please share below! Tagged Eat And Run, kimchi, Scott Jurek, sweet potatoes, vegan dinner, vegan lunch. Bookmark the permalink. Scott is one person I must meet before I leave this earth. I just adore him and he seems so cool. I live across the water from Seattle, so I hope to stumble into him at Chaco Canyon Cafe sometime. These wraps look delicious! Thanks Britt! I’m sure you know that he used to live in Seattle. If you follow him on social media, you’ll see when he announces coming back here. I randomly saw his announcement on Facebook a week before the event, and was glad I did!